Click this link to visit our YouTube Channel to watch even more German Shepherd specific videos. Remember, GSD training is an important part of owning your dog. GSD training /German Shepherd training can begin with a young puppy and continue through adulthood . . . Car travel training with your dogs and puppies is something that needs to be done to prepare your dogs for all future trips you'll both be going on . . .
Parvovirus is one of the most contagious and potentially deadly viruses that dogs can become infected with . . . 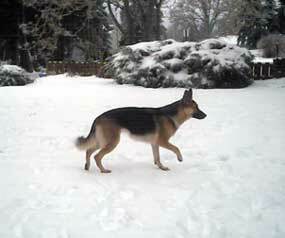 Here is a story about Stinger the German Shepherd - a German Shepherd that loves to swim. Enter your pampered pooch in our Total-German-Shepherd.com GSD of the Month Photo Contest, a brand new contest for German Shepherd owners and lovers and their favorite dogs! Watch here to learn more about it. If you are looking for a German Shepherd breeder in your area, please check this page to see if we have any GSD breeders listed that are close to you. And if you are a German Shepherd breeder interested in advertising with us you might be interested in checking this page out too. YES! I want to claim my free instant access to the SitStayFetch 6 Day Dog Behavior and Training course ($27 value). "Thank you for your generous offer! We ... could definitely use the food vouchers. Mid-Atlantic German Shepherd Rescue, Laurel, MD "